Daily blog coverage of the Trenton Thunder, Double-A affiliate of the New York Yankees – run by beat writers Dan Pfeiffer and Matt Kardos. (TRENTON, NJ.) After a rollercoaster 3-3 road trip through Erie and Akron, the Thunder looked to halt a three-game skid when they welcomed in the Portland Sea Dogs for their home opener at Arm & Hammer Park on Thursday night. Manager Al Pedrique handed the ball to southpaw Miguel Sulbaran, who gave up two earned runs in three innings in the teams season opener against Erie on April 10. The 21-year old Sulbaran cruised through the first five innings; facing just one over the minimum over that span. Portland starter Luis Diaz matched zeros with Sulbaran through four innings before cracking late in the fifth. With two outs in the frame, Mason Williams laced a fastball into left field before scoring on a well-struck double to left-center by Cito Culver. After both teams squandered huge scoring opportunities in the sixth inning, the Sea Dogs were finally able to get on the board in the seventh. Leading off the inning, clean-up hitter Keury De La Cruz struck a line drive down the left field line that Mason Williams failed to grab on a diving attempt, allowing the ball to roll all the way into the corner as De La Cruz came around to score on an inside-the-park homer to tie the game. After a leadoff walk by Jonathan Roof and a single by Mike Miller, Carlos Asuaje slapped a one-out single to right field off of Nick Goody to plate Roof and give Portland a 2-1 lead in the top of the eighth inning. Down to their final strike of the night in the ninth inning, Mason Williams lined a two-out single to right field off of Portland closer Dayan Diaz to score Eric Jagielo and tie the game at two run apiece. 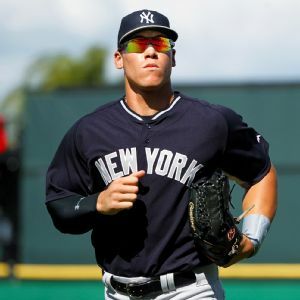 The game would go into extra innings and with two outs in the tenth, Aaron Judge stepped to the plate and blasted a majestic home run that cleared the left field wall and soared into the deep Trenton night to give the Thunder a 3-2 walk-off victory. The homer by Judge effectively snapped a streak of three consecutive one run losses for the Thunder. Pedrique was glad to see his team continue to fight and pull one out in dramatic fashion. Rolling Thunder is in no way associated with the Trenton Thunder, Eastern League, New York Yankees, or its employees or players. All information is subject to change. All views and comments made from outside parties, other than Rolling Thunder personnel, are subject to their own permission. They are not the views of Rolling Thunder or any of the aforementioned parties. If you have any questions regarding this policy, or for more information, please contact Rolling Thunder.